Galleries, studios, museums and collectors will from time to time have one or more artworks consigned to them. These artworks remain the property of the consigning owner and are placed with you for a temporary period only. Most often this will be a collection of artworks from an artist placed with a gallery for sale. The gallery will be responsible for stock keeping and managing these artworks until such time as they are placed back with the artist or removed from the consignment if they have been sold. They are included in stock reports and are considered as part of your stock. When a new artwork is created use this checkbox to mark this artwork as having been consigned into Tessera by the owner. Tessera expects an owner to be entered for consigned artworks and you’ll receive a warning if this is not the case. 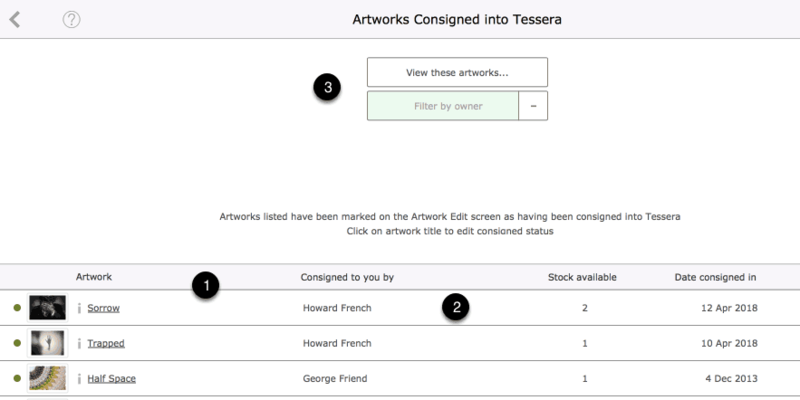 Existing artworks entries can be marked as consigned into Tessera from the Artwork Edit Screen at any time. All stock associated with the marked artwork is considered consigned into Tessera. Consignement settings can be modified on the Artwork Edit Screen. 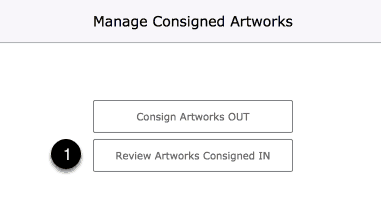 Consignment settings also appear on the Artwork Dashboard. 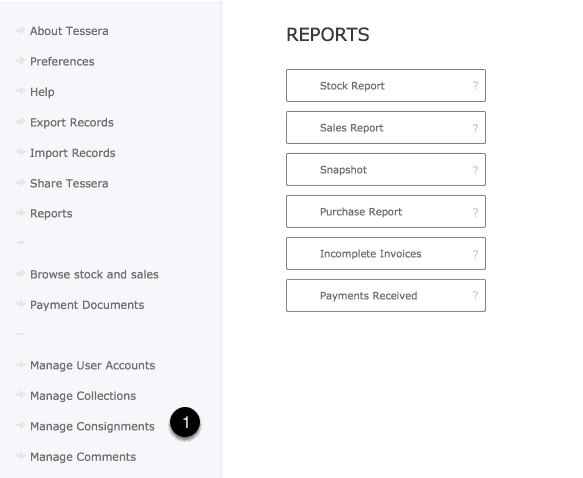 From the home screen use the Manage Consignments button to access the Consignment Access Screen. Once on the Consignment Access Screen use the Review Artworks Consigned IN button to review all artworks consigned into Tessera. All artworks consigned into Tessera are listed here. Click on Artwork Title to alter an artwork’s consignment status. Filter the artworks displayed by owner and use the View these artworks… button to return to the artwork component and review the found artworks only. You can then select to print or export these artworks. From the People Component of Tessera select to view the Consigned In tab to review all artworks consigned into Tessera by the selected artist/owner. 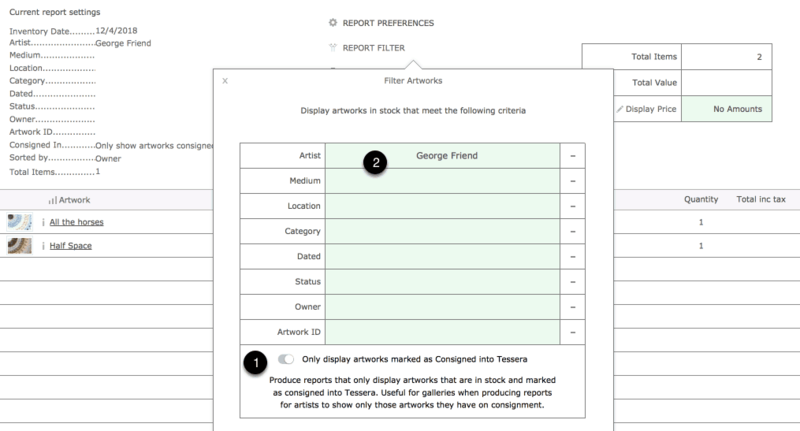 Use the Stock Report and conduct a search for all artworks owned by the owner who consigned the artworks into Tessera. Use the setting that will restrict the report to just artworks marked as consigned into Tessera. 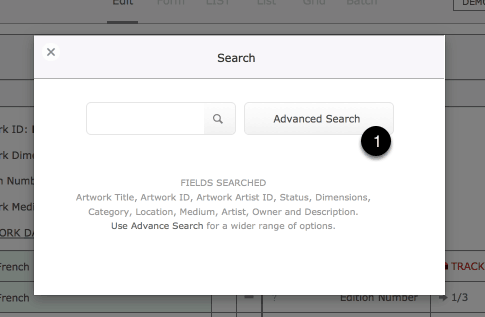 Use the filters to narrow the range of consigned artworks being displayed. Select the Consigned In search button to view all artworks consigned into Tessera.